If you are planning a bathroom renovation project, a floating bathroom vanity is a good option to consider. What is a Floating Vanity? A floating vanity, or also known as a wall-mounted vanity, is a vanity that is attached to the wall that gives it an illusion that it is floating. 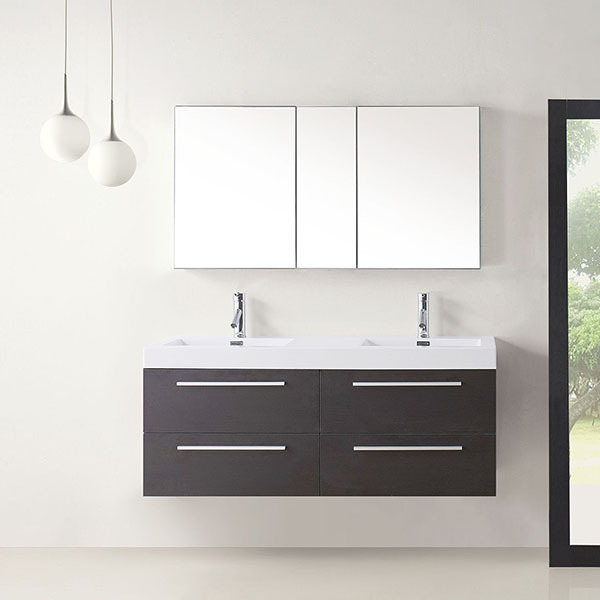 Floating vanities are one of the top bathroom design trends and it’s easy to see why it has become so popular. A standard vanity is mounted to the wall and anchored by its base. These are freestanding vanities. A floating vanity is mounted to the wall only giving it the illusion that it is floating. It also provides a semblance of roominess to a small space. The unique look of a floating vanity is a step out of the ordinary and is easily the focal point to any bathroom concept. 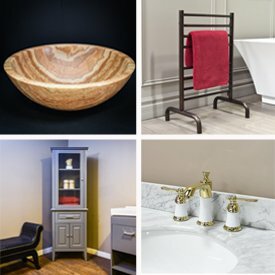 Why are Floating Vanities Popular? Flexible Height Adjustment - Unlike a freestanding vanity that rests on the floor, a floating vanity can be installed at any height for the comfort of the household members. Spacious - A floating vanity gives an illusion of more space as it provides an unimpeded floor to the bathroom. This also prevents making your bathroom look cluttered. Upgrade from Pedestal Sinks - A floating vanity is a great alternative to a pedestal sink that does not provide any storage space for toiletries and other items. Easier to Organize and Clean - Unlike having a base or edges from a freestanding bathroom vanity, cleaning and organizing your bathroom will be much easier and more practical. Minimalist Design - With its minimalistic look, a floating vanity will draw attention to other areas of the bathroom such as freestanding bathtub. Different Styles - A variety of styles, finishes and configurations are available including models with a vessel basin or an integrated basin countertop. Easy to Customize - Sizes range from a compact single sink configuration to a full size double sink. This is advantageous in designing a powder room to a master bathroom. Wall mounted shelves can also be installed to add an extra touch of uniqueness that is uncommon in most bathrooms. Can be Difficult to Install - This is a common issue with wall-mounted vanities. It can be difficult to install without professional help due to the need to install supports and making sure it is even. Calling a professional can easily help guide you through the process. Fortunately, once it is installed properly, you will have a beautiful and unique vanity to impress your family and friends! Not a Traditional Design - Due to the nature of the floating vanity, it is not meant for traditionally designed bathrooms. This is a modern vanity. The drastic change in appearance will affect the overall design of your bathroom. Who is going to be using the vanity? This will help determine the height adjustment for your vanity. If you expect toddlers to be able to use the vanity, you will need to mount the vanity at a lower height. On the contrary, if adults will be the primary users, you will need to place it at a higher height. Are Floating Vanities Good for Small or Large Bathrooms? Floating vanities excel at making a small bathroom look spacious without sacrificing a lot of storage space. While this may be true in the past, production of larger width, wall-mounted vanities have been designed to accommodate large bathrooms as well. Sizes as small as 16 inch vanities exist to as large as 72 inches. Who will be Installing the Floating Vanity? Simply put, installing the vanity will be a DIY project or you will be hiring a professional to do the work for you. Is it easy to install a floating vanity? Yes and No. Floating vanities require wall-anchors in order to hang the cabinet. While, setting up the anchors is not too difficult to do, making sure all the supports and the cabinet are secure and not crooked is the tricky part. Where Can I Buy a Floating Vanity? 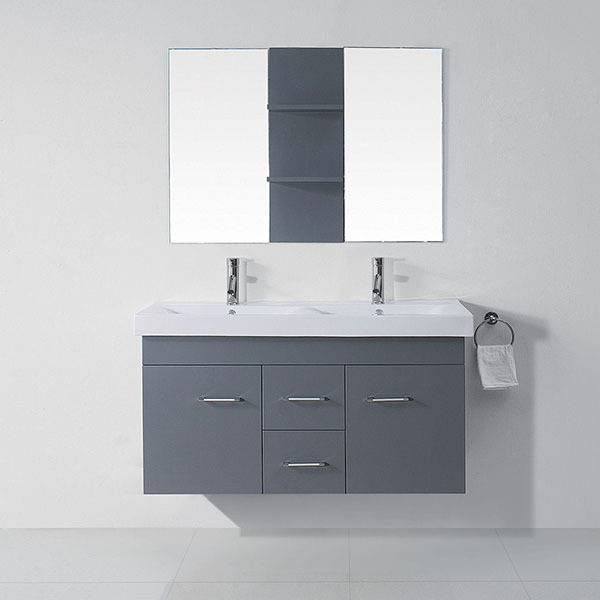 Luxury Living Direct offers free shipping on a variety of styles, finishes, designs and features of floating vanities. Sizes range from 16 inch to 72 inch to accommodate any bathroom. Not only do we have an extensive selection of floating vanities, we also have other items we can match to build your bathroom oasis. We have sizes to suit any bathroom and styles to compliment any bathroom design. We can help you design a small contemporary powder room to a large spa-like master bath. Complete the look of your new contemporary bathroom with a sleek freestanding bathtub or a convenient towel warmer. Have one of our expert representatives assist in designing your ultimate bathroom.